SUBHEAD: Two years ago birds were found with patches of white feathers related to their radiation exposure. Image above: Slide from presentation of Ken Buesseler on impact of radiation entering the ocean in Japan and on the US west coast. Ray Songtree emailed me a link to a video of Dr. Tim Mousseau's presentation on the biological impacts of the Chernobyl and Fukushima nuclear power plant meltdown disasters. It was an excellent report as part of a three part video presentation produced by the Ecological Options Network (EON). We are these videos in reverse order, beginning with Beth Brangan's of EON "Neither Panic nor Denial", followed by Tim Mousseau's "Bio-Impacts of Chernobyl & Fukushima", and finishing with Ken Buesseler's "Fukushima from Two Sides of the Pacific". Video above: Presentation by Beth Brangan of "Neither Panic nor Denial". "EON's Mary Beth Brangan sums up an evening of presentations on Fukushima contamination by independent research scientists Ken Buesseler, of Woods Hole Oceanographic Institution, and Tim Mousseau, Department of Biological Sciences, University of South Carolina. Brangan explains why the independent scientific evidence so far strongly supports applying the Precautionary Principle in crafting the appropriate public policy response to radioactive fallout from the on-going Fukushima nuclear disaster in Japan. She calls for international solidarity with the plight of dispossessed & exploited Fukushima refugees, and the explosive, youth-led current Japanese grassroots campaign against the militarism and nuclear brinkmanship of the US-supported Abe regime. Video above: Presentation by Tim Mousseau of "Bio-Impacts of Chernobyl & Fukushima". Evolutionary biologist Dr. Tim Mousseau shares findings from his unique research on the biological effects of radiation exposure to wildlife from the nuclear disasters at Chernobyl & Fukushima. 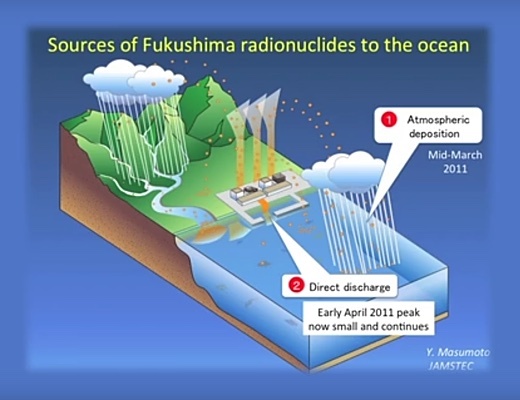 This is part 2 of a 3-part series of presentations on Fukushima contamination by independent research scientists Ken Buesseler, of Woods Hole Oceanographic Institution, and Tim Mousseau, Department of Biological Sciences, University of South Carolina. Video above: Presentation by Ken Buesseler of "Fukushima from Two Sides of the Pacific". Marine biologist Dr. Ken Buesseler, is Senior Scientist at the Woods Hole Oceanographic Institute's Center for Marine and Environmental Radioactivity. Introduced by Mary Beth Brangan, Co-Director of EON, Dr. Buesseler reviews his findings so far in his on-going citizen-funded project monitoring the continuing radioactive contaminiation from japan's Fukushima triple nuclear meltdown. Within months of the Fukushima disaster, Ken Buesseler assembled an international research cruise to sample the waters surrounding the nuclear plant. To date, important fisheries remain closed due to cesium levels above Japanese limits for seafood. Ocean currents are bringing the radioactive particles released from Fukushima to the West Coast. Buesseler now monitors over 50 sites along the West Coast, from Alaska to Mexico, with citizen-scientist funding and participation. In june of 2014 off the coast of northern California and April 2015, in Ucluelet BC, radioactive cesium from Fukushima was detected in ocean water samples.